The Dead Will Have Their Revenge! 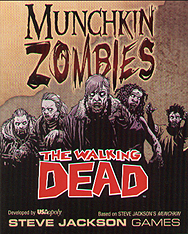 Based on the hit comic book series, this 56-card expansion to Munchkin Zombies lets you show your favourite Walking Dead characters who's really in charge. The undead rule! Do battle with deadly living foes like Rick, Michonne, and Negan. Whack them with a deadly Katana or the brutal Lucille... Take their stuff and shamble toward victory. Level up to become the most badassa undead of all. Show the living that the world belongs to The Walking Dead.